Hindu temples are sacred places of worship with each temple being dedicated to one or more deity. In Ancient India, there was a transition from the traditional practice of Vedic rituals to worship of a personal deity in a temple. The aim of Hindu religion has always been to enable the shifting of human consciousness from a personal deity to the Universal all encompassing Brahman pervading the entire cosmos. Temples vary in their rituals, traditions, architecture, customs and festivals from region to region though the basic features like Pujas, Pandits, Mantras and Prasad is carried out systematically in nearly all of them. One of the most sacred temples of Bihar is the Aranya Devi Temple at Arrah located in the Chowk area of the district of Bhojpur. From ancient times, Aranya Devi is venerated as the Goddess of the masses who grants all desires. Hence, devotees come to the temple taking vows for fulfilment of their desires and then offer gifts as thanksgiving after their desires have been fulfilled. The temple is one of the oldest temples built on stone boulders and it is said that one of the idols of the Goddess was consecrated by the Pandavas when they were roaming in the forest. There are many legends regarding the temple. According to the first legend, King Mordhwaj of Arrah was renowned for his generosity. In order to test him, Lord Krishna disguised himself as a hermit and accompanied by Arjuna as a lion went to the King. He asked the King to feed his lion with human flesh informing him that the lion did not eat animal flesh. He then asked him for the flesh of his son. The King after obtaining his wife’s consent agreed. The hermit then asked the King and queen to dissect the body of their son with a Saw (Arrah) and cook the flesh. They obeyed him at once. He then suggested that they all sit together to eat the cooked flesh. They again did as requested and impressed with their humility, the hermit then asked the King to call out the boy’s name and to their joy and amazement, the boy appeared before them. They then revealed their true identities to the King who was overwhelmed with joy. The Saw (arrah) was thrown away and it is said that the temple was erected by King Mordhwaj in the place where the Saw fell. According to the second legend, King Mordhwaj though generous and compassionate was sad as he and his wife had no issue. With intense devotion they began to pray to Goddess Durga. Finally pleased with their prayers, the Goddess appeared to the King in his dream and granted their desire. A son was soon born giving joy and pleasure to his parents. After a few years the Goddess appeared in the King’s dream and asked him to sacrifice his son at her altar without shedding any tears, by holding one end of a saw with the queen holding the other end thus cutting the boy into two halves. Bowing to the Divine command the King, Queen and the Prince prepared to follow it. As the sacrifice was about to begin, the Goddess appeared before them, pleased with their devotion and blessed them. The King then installed a temple of the Goddess and the place came to be known as Arrah after the Saw. Some other legends claim that the area was covered with forests with the river Ganga flowing nearby and a temple was built for the Goddess of the forest called Aranya Devi, Aranya meaning forest. The temple has a round dome and faces the East. There are two porticos to the North and West sides of the temple and a courtyard at the entrance of the temple. The West portico or veranda has three bells, with a statue of Nandi and a Shiva linga along with a well alongside it. There are two main deities of Aranya Devi in standing pose, one at 3 feet and the other at 2 feet in height. Their Singhasan is 10 feet high and they are attired in yellow saris with flower garlands and paper crowns (Mukuts) on their heads. To the North side of the temple, there are white marble statues of Krishna and Radha and to their left are statues of Ram, Sita, Lakshman, Bharat and Shatrughan which were installed lately in 1953 AD by a few businessmen. The exact date of the temple is not known and the mosaic work and architecture in the temple are visible as the whole temple has been reconstructed in modern times. 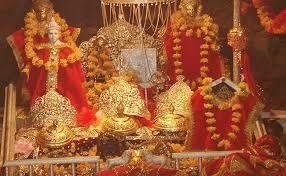 Air – The nearest airport is at Patna which is at a distance of 57 km from the temple. Rail – The nearest railway station is the Arrah railway junction which is at a distance of 4 km from the temple. Road – Buses run through Arrah from Patna to Varanasi. Rickshaws and horse drawn carriages or Ekkas are also available from the railway station to the temple. There are rest houses and dharamshalas near the temple. Hotels of various budgets are available in Patna and in the towns of Bhojpur and Arrah. Temples in India evolved over the centuries from simple rock-cut cave shrines to huge edifices of architectural splendour incorporating the design and style of the artisans of the various dynasties ruling at different periods. Essential elements of the temples were incorporated with precise and harmonious precision with geometry and grid plans. The temples were considered the dwelling places of the Gods, thus every aspect in the temple has deep inner esoteric significance helping the pilgrim in his quest to attain peace and happiness. Prayer with supplication to the deities was also believed to lead to fulfilment of desires and people came from all over the land to pray for wealth, progeny, alleviation of disease and sickness and other worldly desires along with spiritual upliftment. The worship and prayers of pilgrims for thousands of centuries creates a strong spiritual current which transforms the temple into a vibrant and potential force helping future generations who visit the temple.